Auto da Fé was originally published as Die Blendung in 1935 and was translated in 1946 by C.V. Wedgwood (Dame Cicely Veronica Wedgwood) and was translated ‘under the personal supervision of the author’. A more literal translation would be, I believe, The Blinding. Auto da Fé refers to the burning of heretics by the Spanish and Portuguese inquisition. I first read this book about twenty years ago and have been meaning to re-read it for years; GLM4 has given me a good excuse to do so. The book is split into three parts: A Head Without a World; Headless World; The World in the Head. The first part introduces us to the main character, Peter Kien, who lives his bookish life largely inside his own head. In the opening pages we see Kien as he goes on his daily early morning walk which he takes between seven and eight o’clock before the bookshops open so he won’t be tempted to buy any more books but also to reassure himself that the bookshops only sell substandard books. He has his own personal library of 25,000 volumes, mostly on his specialist subject of Chinese Literature, and he even carries around a small portion of it in a suitcase wherever he goes. Unusually for Kien he takes an interest in a small boy who seems to share his interest in Chinese literature, maybe because this boy reminds him of himself as a child. We soon learn that Kien has a housekeeper called Therese Krumbholz who has been employed by him for eight years; she was attracted by his advertisement in which it was stated that ‘money was no object’. Kien’s wealth comes solely from an inheritance and although he publishes papers he’s not employed by any academic institution. He lives frugally except when it comes to acquiring books. He dislikes talking: ‘The greatest danger which threatens a man of learning, is to lose himself in talk.’ Food is irrelevant to him: ‘As a rule he would not have been able to say what precisely he had in his mouth.’ But he likes books and thinking: ‘He reserved consciousness for real thoughts; they depend upon it; without consciousness, thoughts are unthinkable.’ Therese, in her blue starched skirt, believes that Kien has a secret vice – just what does he do in his study between six and seven a.m.? One day he believes that Therese is taking an interest in his books and he offers to lend her one. When he’s reminded of his promise he gives her a tatty old novel and is surprised and impressed with the reverence that she has for it; she wears gloves to handle it, she wraps it up to stop it getting damaged and re-reads each page several times. Throughout the novel Kien and the other characters make decisions through torturous logic which they usually regret, so it is very often difficult for us, the reader, to understand their thought processes. Impressed by her devotion to books and taking advice from an imaginary conversation with Confucius Kien rashly decides to marry Therese; this is the beginning of his downfall. Therese grabbed him by the legs of his chair and shoved him heavily to one side. She let go of the chair, went over to the writing desk and pulled out a drawer. She searched through the drawer, found nothing, and made for the next one. In the third, fourth and fifth she still could not find what she wanted. He understood: a ruse of war. She was not looking for anything; what could she be looking for? The manuscripts would all be alike to her, she had found papers in the very first drawer. She was working on his curiosity. He was to ask, what was she doing there. If he spoke he would be stone no longer, and she would strike him dead. She was tempting him out of his stone. She tore and wrenched at the desk. But he kept his blood cold and uttered not a breath. By the end of Part One Therese throws Kien out of the flat – but he at least has the bankbook. Women ought to be beaten to death. The whole lot of them. I know them. I’m fifty-nine. Twenty-three years I was a married man. Almost half my life. Married to the same old woman. I know women. They’re all criminals. You just add up the poisoners, Professor, you’ve got books, have a good look at them. Women haven’t any guts. I know all about it. When a man tries anything on with me, I smash his face in so he has something to remember me by, you sh–, I say, you dirty little sh–, how dare you? And so, with Part Two it gets even more weird. Kien ends up getting involved with a hunchbacked dwarf called Fischerle who is also intent on relieving Kien of his money which he has withdrawn from his bank account. Curiously he actually has Kien’s wallet twice in his hands but can’t seem to simply steal the money. Instead, when they visit a pawnbrokers he convinces Kien that when people pawn their books there they actually get eaten by the ‘hog’. Kien is so distressed by this that he stands watch on the stairs and pays people to take their books away from the hog. Fischerle soon gets a group of old friends together to take books along to the pawnbrokers when Kien is standing guard so that Fischerle can get Kien’s money. In his warped mind, Fischerle believes that he’s getting Kien’s money legally and that he’s a great entrepreneur. There’s just too much to mention in this section; we learn that Kien can somehow load up his head with physical books and unload them at night – or is this just Kien being delusional? We can never be too sure. There is also a brilliant scene when Therese and Pfaff turn up at the pawnbroker’s to pawn some of Kien’s books – a magnificent tussle ensues and then an amazingly confused trip to the police station. This scene highlights how none of the characters ever understand what any of the other characters are thinking, feeling or what motivates them. They’re all isolated from each other and are just interested in their own obsessions. Fischerle however escapes with most of Kien’s money and the last chapter of Part Two is probably the weirdest of the novel; we follow Fischerle as he’s preparing to go to America (or Japan – it’s a bit confusing!) until a surprising and shocking ending involving a button. Part Three initially calms down a bit and we get a bit of background information about Pfaff and we learn that he’s even nastier than we’ve thought up until this point. Kien is temporarily staying at Pfaff’s basement flat whilst Therese is still occupying Kien’s flat. Pfaff is virtually living with Therese and is spending most of his time there as well. In all the confusion of Part Two Fischerle had sent a telegram to Kien’s brother George, a famous psychiatrist, and out of concern for his brother George turns up and helps to restore an element of calm and order. So there’s a happy ending? Er, almost, but not quite! As with the rest of this novel it can easily turn weird and/or nasty. If you enjoy Kafka or Beckett then you should enjoy this novel. This sounds fascinating. Oddly I can relate pretty directly to parts of my own life history from the life of the central character. I was saved partially by a very good woman. A lot of German literature contains references to hunchbacks, curious. It’s well worth a read if you haven’t read it before. It was, and happily still is, one of my favourite novels. Fischerle, the dwarf, is described as evil on the blurb on the back of the book but I didn’t get that from the reading; he was just on the make, trying to make some money as most of the other characters were trying to do. Admittedly, he and the others, did this by preying on the weak, i.e. Kien, so I’d say he was immoral. It’s certainly worth reading if you can find the time. The text is quite dense and the narrative is deliberately opaque at times – but I find that’s part of the fun with these types of books. 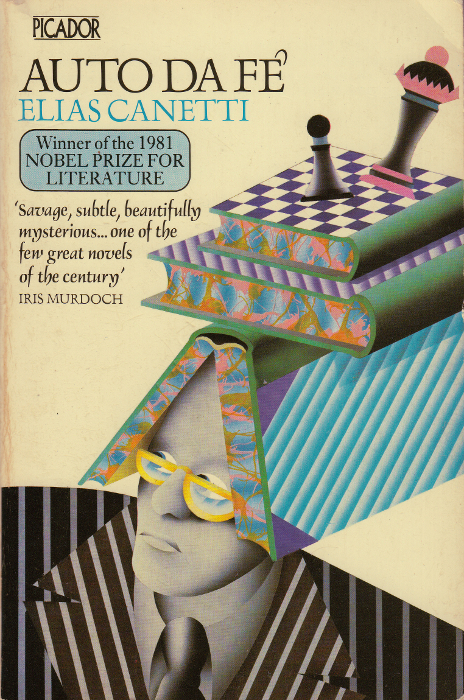 It’s almost thirty years since I read this and your review has stirred my vague memories. Maybe the time to take it off the shelves and read it again is near. Yes, it was twenty years or more since I first read it. I was a bit worried I wouldn’t find it that good this time but it was. It’s a bit patchy though; Part Two was a bit silly at the beginning and the ending of the novel didn’t really work for me but overall I’m still impressed. Wonderful review, Jonathan! I loved your description of the first part of the book – I would like to read the book for that alone. Kien’s fascination with Chinese literature made me remember my own fascination with it once upon a time – I used to buy every volume of classical Chinese literature that I saw at the bookshop. I hope to read them all eventually. Thanks Vishy. I think the first part of the book is probably the best. The second part doesn’t start too good IMO but it does improve. Each part is quite different in tone and style and you almost feel as if you’re reading three different novels. I virtually have no knowledge of Chinese or Japanese culture and literature; I keep meaning to read some history books but keep putting it off. Thanks for all the info Mytwostotinki, it’s fascinating. I really like the idea of the ‘mentally ill Comedie Humaine’. It’s amazing that Canetti didn’t publish any more novels but let us hope that some manuscripts do appear. After I first read Auto da Fé I went on to read Crowds and Power and at least two of his autobiographical memoirs. I can’t remember too much about them now except little Elias making up conversations with imaginary characters in the wallpaper. What do you make of the last chapter? The chapter before it ends reasonably happily and then the last chapter just obliterates it; it was almost as if Canetti had a change of heart with the ending. In a way, it mirrors Fischerle’s fate at the end of Part Two. Thanks Lisa. I read your excellent review after I finished Auto da Fé – I’m glad you liked it. I was a bit unsure if I’d like it as much a second time but if anything it was better! I did read some of the volumes of his autobiography but I think I got rid of them, except for the first volume which I still have here. I’m contemplating a read/re-read of those – maybe in 2015. PS Can you please add a widget to your sidebar that lets me subscribe to your blog by email? Hey man were you able to understand the final chapter? I couldn’t quite get it…i mean he’s hallucinating a bunch of stuff but is the fire real? if so, how did he start it? I can’t quite remember the details now but I took the fire as being real, I think. I might have another read of the last chapter.